Click on our BLOG page for the most recent Lumber Commodity Price List. Know your Plywood, an article on plywood and siding ratings and their correct uses. The 50-year limited warranty is proof Weyerhaeuser Edge Gold™ panels perform. Thanks to patent-pending Down Pore® self-draining technology (see video HERE) and a proprietary edge seal, Weyerhaeuser panels withstand the elements so well that they can allow framers to extend their building season and there is now no reason to drill holes to allow rainwater through. Weyerhaeuser also provides a 200-day “no sand” limited warranty. Weyerhaeuser Edge Gold panels install flat and stay flat and have a precise tongue-and-groove fit. For installation video click HERE or click HERE for a printable .pdf on installation. Oriented Strand Board is a widely used, versatile structural wood panel. Manufactured from waterproof heat-cured adhesives and rectangularly shaped wood strands that are arranged in cross-oriented layers, OSB is an engineered wood panel that shares many of the strength and performance characteristics of plywood. OSB’s combination of wood and adhesives creates a strong, dimensionally stable panel that resists deflection, delamination, and warping. Panels resist distortion when subjected to demanding wind and seismic conditions. 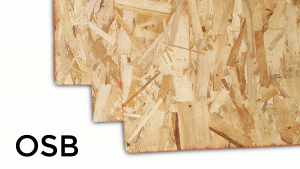 Relative to their strength, OSB panels are light in weight and easy to handle and install. APA-trademarked OSB is suitable for a variety of end uses including subflooring, single-layer flooring, wall and roof sheathing, sheathing ceiling/deck, structural insulated panels, webs for wood I-joists, industrial containers, mezzanine decks, and furniture. The letters “C” and “D” represent the quality of the front and back surfaces of the plywood. “A” is the best plywood surface you can buy which means plywood without any noticeable knots, holes, or defects. “X” in CDX is for the purpose plywood should be used. 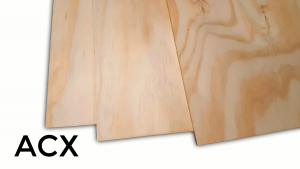 “X” stands for “exposure”, meaning that the plywood is designed to withstand some moisture exposure. 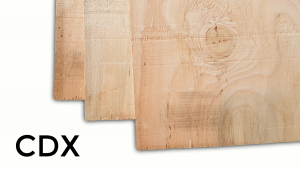 ACX and CDX plywood is made of layers of thin sheets of Douglas Fir in alternating wood grain directions, which will increase the strength and stiffness the panels while providing great dimensional stability that will resist warping. ACX and CDX are great for jobsite needs such as temporary structures and ideal for remodeling or new construction in residential or light commercial construction. Excellent nail, screw, and staple holding ability allows placement near panel edges without splits and are light enough to carry and tend to be easier on cutting tools than OSB.